I heard that and started reading the description from the menu. Soon I was confused. To be honest the whole combination of ingredients sounded a little cacophonous to me. Pan means “bread” and Cazón is the “flesh from a little shark”, so “fish”. My overheated brain could not elaborate an objective idea of what this dish meant. Our friend was very enthusiastic about the idea of us trying the most iconic dishes from the city. I listened to her description and agreed to try something new. To my pleasant surprise when the plate arrived I was hit with the most delicious aroma of the warm tomato sauce. 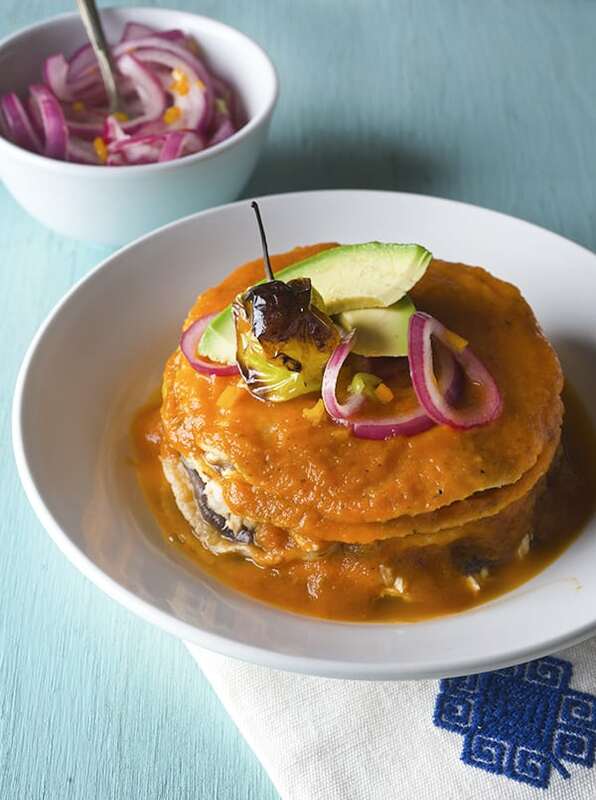 The plate was layered with a short stack of tortillas covered with the bright aromatic and silky orange color sauce. A charred green habanero garnished the top of the stack like the cherry on top of a cake, loud and proud, and the perky steam insinuating bit me. So as I dug into it… I can see the layers of tortilla, black beans, and sauteed fleshy white fish. My first bite confirmed what I suspected. This “Pan de Cazón” was a harmonious and a conspicuous ceremony of ingredients aligned in such a way that it was absolutely delicious. Why? Well, to describe the dish in detail, imagine four freshly handmade corn tortillas slightly fried, smothered with silky herbaceous loosely refried black beans (frijoles colados), flaky, slightly smoky, juicy, and tender white fish sauteed with onions and tomato; all stacked into a four tortilla tower, and then sauced generously with probably one of the world’s earliest cooked tomato sauces. 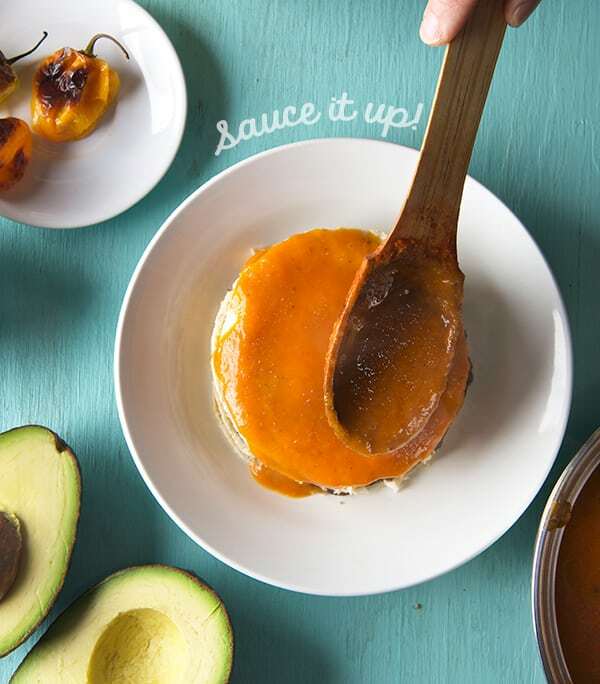 Chiltomate is a rustic sauce, made with the simplest ingredients tomato, onions, and chile. Pure pre-conquest Mayan ingredients, roasted, crushed, seasoned with sea salt and sieved until it yielded the purest, silky, fruity, honest and yet bold tomato sauce. For an architect and a cook, this was a glorious construction of flavor. With my first bite, I understood Campeche. Pre-conquest flavors elevated in a simple harmonious way. I think from that day and the next 10 days we stayed in the city, I ordered Pan de Cazon at least once a day. Yes, because you can have Pan de Cazón for Breakfast, Lunch or Dinner. In my Campeche, you can. Now, Why you would want to make this dish? 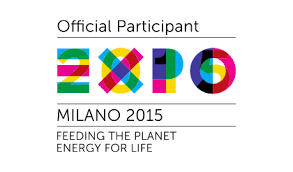 I will give you one good enough reason: “People, Friends, Cooks, Foodies, Health nuts, Mommas and Papas, Students, PLEASE! Look for variety in your fish. Eating salmon, tuna, the same fish over and over can make for a monotonous cuisine and also is not healthy for our oceans. Explore other fish sizes, ranges, flavors, and preparations, expect great rewards! Fish do not have to be bland, or muted, or fried, smothered in a batter, ketchup and tartar sauce, to taste good. I just have to be fresh. Campechanos have a saying “when fish smells of tastes like fish do not eat it” period. Get the freshest fish you can, search a good source in your city. If you are landlocked as I am here in Texas far away from the coast, investigate local markets for the less traveled fish you can find. Based on this memory I tried to recreate the recipe. The way I remembered, the way I wanted it to taste. I read some recipes but the flavor profile does not resemble of what I tasted there. I had to rely on my tastebuds memory to recreate the recipe. Fifteen years have gone by since I was in Campeche, and if my memory is faithful I think I have achieved a close match. Apologies to all the amazing Campechanos Cooks, is not my intention to disrespect the recipe, it is in fact the opposite to make it as close in flavor as I can with what I have in this location, pure Genius Loci. I have been cooking in the states for a long time, and I have found that sometimes even if you are using the correct ingredients, food, ingredients, and recipes do not taste the same. And of course, they don’t! they never will. Too many variables and a different locus. I have found that for example, Epazote does not taste fresh and fragrant when it has been refrigerated in transport to the market. Searching for that same flavor, I have noticed that a native herb from Texas “Texas Marigold” or “Mexican Mint Marigold”(as some people call it here in Texas) this herb, in combination with dry oregano, tastes very similar to fresh Mexican epazote. And that makes me happier than buying a refrigerated herb. When I taste and recognize the flavor in my taste buds memory and it translates into the food or dish I’m trying to recreate I feel like I hit the jackpot! I have written some of the substitutions, or interchanging ingredients, just in case that like me, you are in another part of the world and in need to make those substitutions. And also the original herb to be used if you are in the right geographical place to traditionally make it. What became of the Biblioteca Universo Maya? Well, we worked on the project for about 6 months, prepared a presentation for the Campeche Governor, went back to Campeche and make the presentation. Proudly one of the best projects we ever made together. Unfortunately the project still on the back burner. Maybe one of these days when the state budget allows it will be built. Could be that the best is yet to come…Right? Igor, Juan Pablo?…will see. This recipe is fairly simple. Besides the different components, all of them are very easy to prepare. 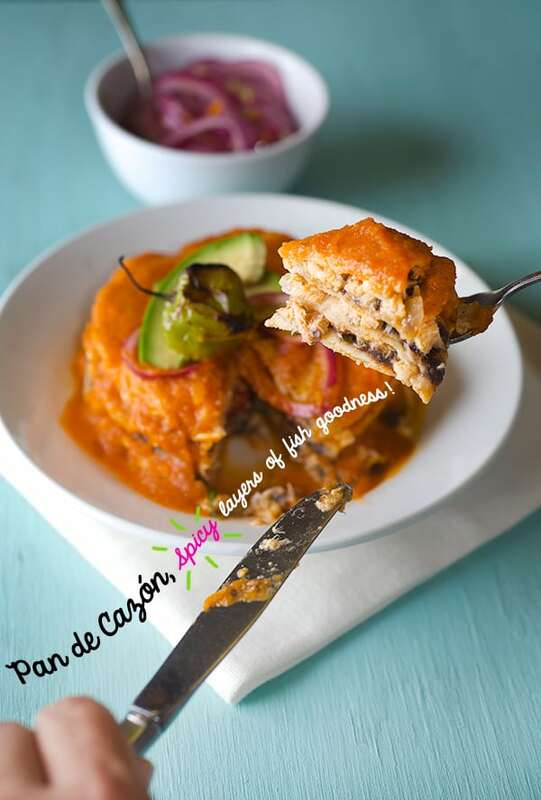 So hold on tight and get your cooking mojo going because after tasting this Pan de Cazón you are going to be having a truly Austin via Campeche dish! 3 cups Chiltomate sauce, recipe follows. 1 lb. Pan de Cazón aka Dogfish, or Red Snapper, Cod or Halibut will work too. 6-8 Texas Marigold fresh leaves or 2-3 fresh epazote leaves. 12-16 medium-large leaves of fresh Texas Marigold or 4-5 Fresh epazote leaves, and omit oregano. 2 pinches of dry Mexican oregano, rub it into your fingers to pulverize and unlock its aroma. Thinly slice the red onions, rinse them well under cold water. Place them on a small bowl add the rest of the ingredients toss well with the help of two forks, let them marinate for at least 20-30 minutes. On a small pan place the fresh fish fillet, along with ½ white onion in wedges, 2-3 Texas marigold sprigs, a pinch of oregano, one garlic, ½ teaspoon sea salt and 2 cups of water. Cover with a lid brings to a barely simmer, and cook until the flesh is white about 5-7 minutes. Remove the lid every now and then and baste the fish with its own broth. Once is cooked, carefully transfer the fish to a plate and save the broth. You will use it into the sauce and when sauteing the fish. On a saute pan, heat up 1 tablespoon sunflower oil, add the other half diced onions. Sweat the onions, add diced garlic, add diced tomatoes, salt and the marigold leaves torn into pieces. Saute for 2-3 minutes, then add the shredded fish, toss well and add about ½ cup of the broth in which the fish was cooked in. Briefly, cook for 2-3 minutes. Taste and adjust salt if necessary. Set aside. The juice of ½ an orange and 1/4 teaspoon of orange zest*optional, the original dish do not includes the orange juice or zest. The tomatoes I bought were a bit lacking in sweetness and fragrance, so I decided to enhance the fruity flavor by using some citrus. Use this ingredient upon the quality of tomatoes you are using. 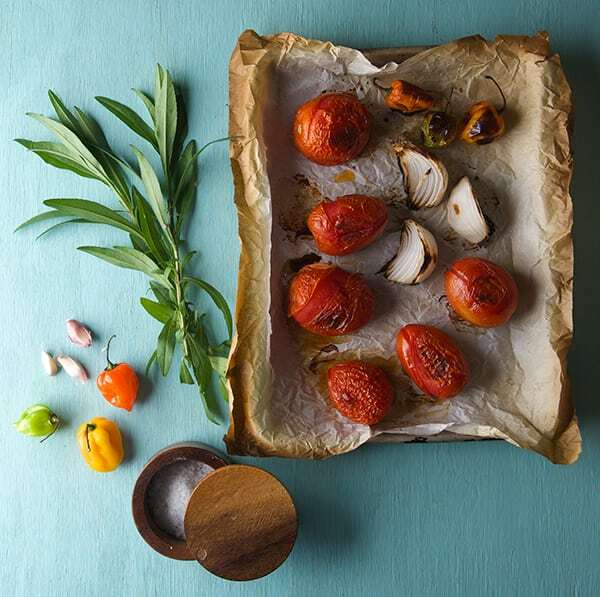 Roast the tomatoes, onion, habanero on a baking pan in a 450F degree oven for about 8-12 minutes or until the tomatoes are chard and blistered, and onions have charred edges. Using a fork and a knife de-seed and devein the habanero. Be very careful not to touch the habanero directly with your hands. This chile is extremely spicy and all the concentrated heat is on the seeds. So use a fork and a knife and dissect the chile. Leave the charred skin on. Place the roasted tomatoes, onion, garlic, de-seeded deveined habanero and the rest of the ingredients in a blender until well pureed. Sieve the pure and add about ¾ cup of the fish stock to wash the reminders of the puree. This will produce the silkiest and smooth sauce, the sieving step is very important because it will remove the tomato seeds and skins. In a small pot heat up the sunflower oil and add the chiltomate puree. Expect to splatter. Lower the heat and bring the sauce to a slow simmer. Cook and reduce liquids for about 6-8 minutes until you have a smooth silky tomato sauce. If the sauce is to watery cook it for a little longer, if it’s too thick add a bit more of the fish stock. Taste and correct seasoning if necessary. On a pan add a drizzle of sunflower or corn oil, until slightly toasty but pliable. 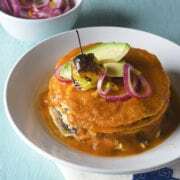 Start by layering on a plate a pan-fried tortilla, evenly spread a tablespoon of the refried black beans. Then add 1-2 tablespoons of the sauteed fish on an even layer. Ladle a tablespoon of the Tomato sauce over the fish, and repeat this layer sequence two more times. Finish the tower with a tortilla. You will have 4 tortilla layers total. If serving multiple plates assemble all the towers at the same time, place them in the oven to keep warm. Keep the tomato sauce warm. Right before serving, baste each tower with about 1 cup of the piping hot chiltomate sauce. Garnish with avocado, pickled onions and do not forget the cherry on the top: the charred habanero! * If you need a homemade tutorial on how to make corn tortillas click here! ** the fish is usually prepared smoked or cooked over charlcoal which add amazing flavor to the dish. If you want to go for it smoke your fish! 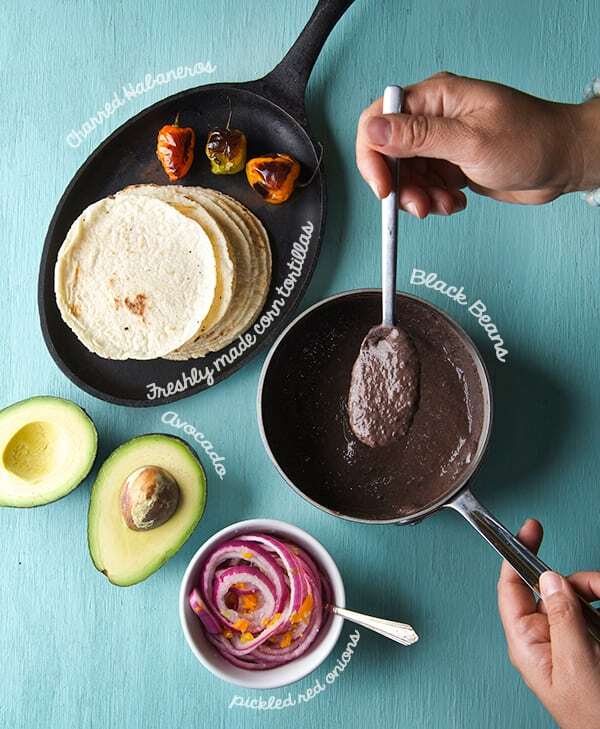 ***How to make refried Black beans click here! 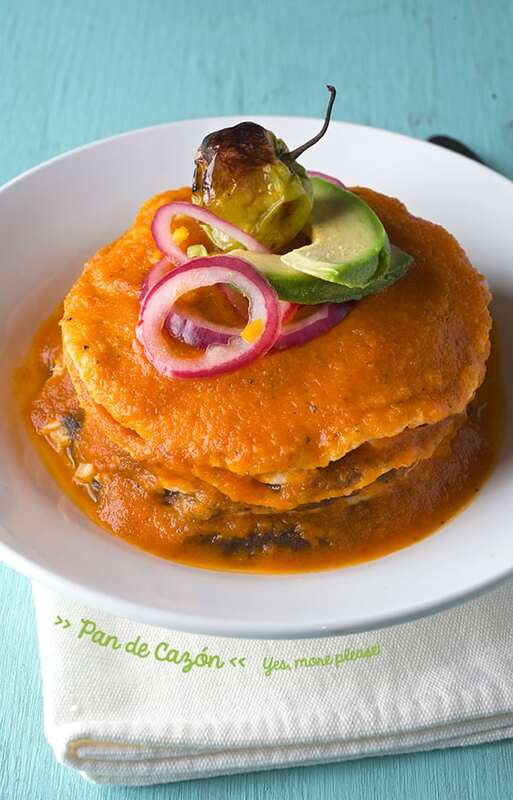 ****Originally Pan de Cazon is served with “Aguacate de Agua”. Which its fruitier and less oily. Its hard to find this type of avocado here in Texas, but I believe that avocado Haas will do great. and smothered with a flavorful tomato sauce, Enjoy! 1 lb. Pan de Cazón aka Dogfish or Red Snapper, Cod or Halibut will work too. 12-16 medium-large leaves of fresh Texas Marigold or 4-5 Fresh epazote leaves and omit oregano. 2 pinches of dry Mexican oregano rub it into your fingers to pulverize and unlock its aroma. 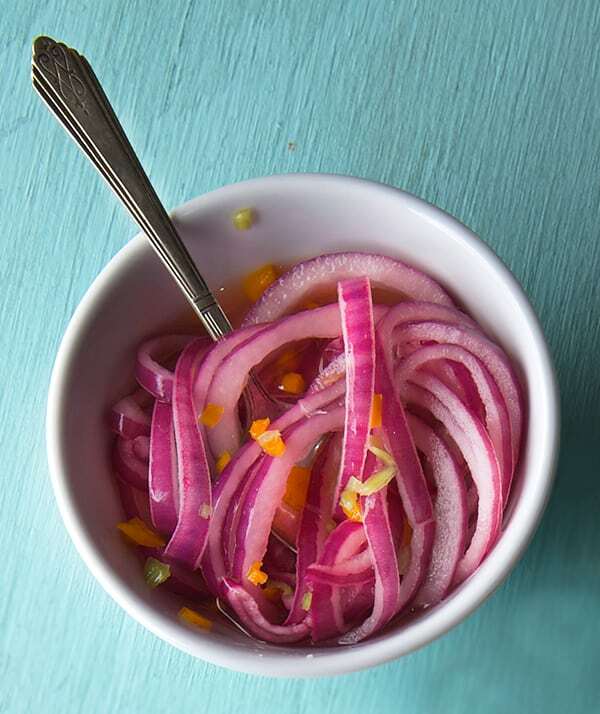 Thinly slice the red onions, rinse them well with cold water. Place them in a small bowl add the rest of the ingredients toss well with the help of two forks, let them marinate for at least 20-30 minutes. On a small pan place the fresh fish fillet, along with ½ white onion in wedges, 2-3 Texas marigold sprigs, a pinch of oregano, one garlic, ½ teaspoon sea salt and 2 cups of water. Cover with a lid bring to a barely simmer, and cook until the flesh is white about 5-7 minutes. Remove the lid every now and then and baste the fish with its own broth. 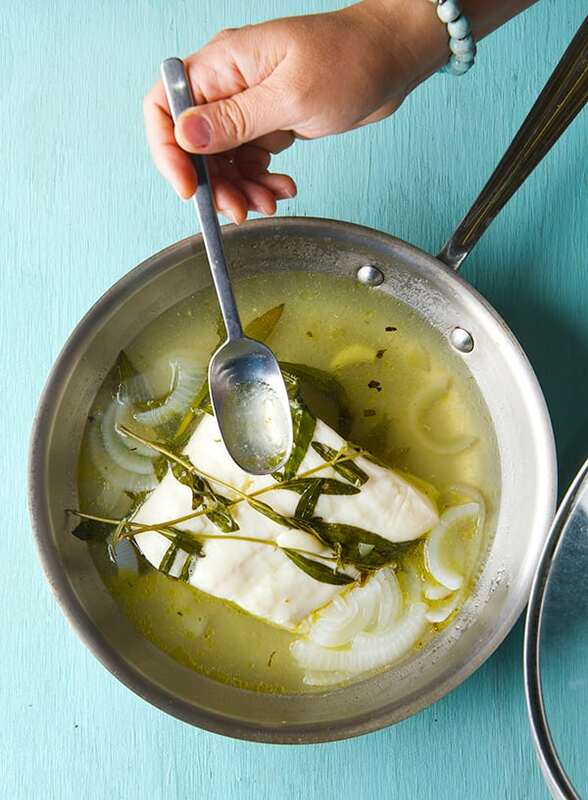 Once is cooked, carefully transfer the fish to a plate and save the broth. You will use it into the sauce and when sauteing the fish. On a saute pan, heat up 1 tablespoon sunflower oil, add the other half diced onions. Sweat the onions, add diced garlic, add diced tomatoes, salt and the marigold leaves torn into pieces. Saute for 2-3 minutes, then add the shredded fish, toss well and add about ½ cup of the broth in which the fish was cooked in. Briefly cook for 2-3 minutes. Taste and adjust salt if necessary. Set aside. In a small pot heat up the sunflower oil and add the chiltomate puree. Expect some splattering. Lower the heat and bring the sauce to a slow simmer. 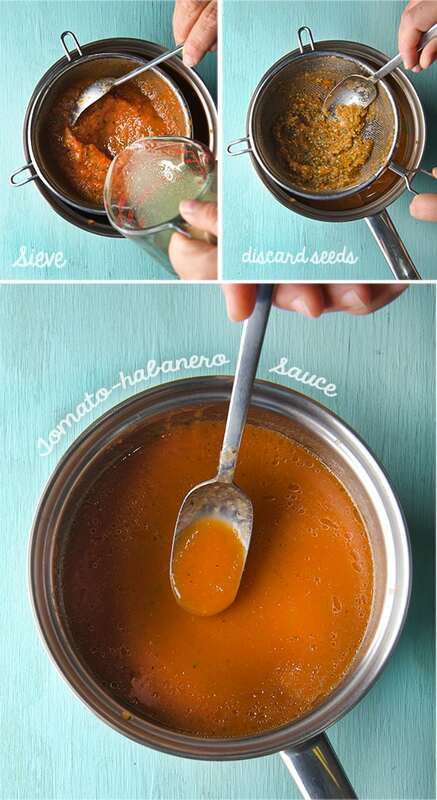 Cook and reduce liquids for about 6-8 minutes until you have a smooth silky tomato sauce. If the sauce is to watery cook it for a few minutes longer, If is too thick add a bit more of the fish stock. Taste and correct seasoning if necessary. 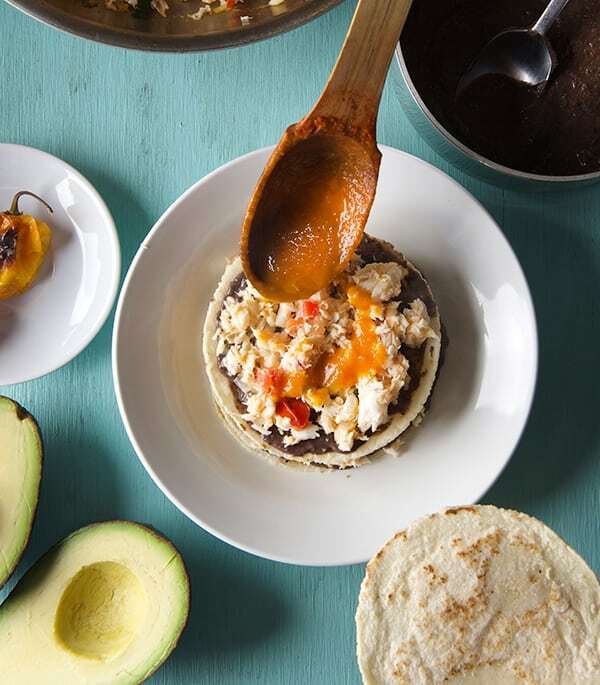 Once you have all the components prepared and warm, start by layering on a plate a pan-fried tortilla, evenly spread a tablespoon of the refried black beans. Then add 1-2 tablespoons of the sauteed fish on an even layer. Ladle a tablespoon of the Tomato sauce over the fish, and repeat this layer sequence two more times. Finish the tower with a tortilla. You will have 4 tortilla layers total. If serving multiple plates assemble all the towers at the same time, place them in the oven to keep warm. Keep the tomato sauce warm. Right before serving baste each tower with about 1 cup of the piping hot chiltomate sauce. Garnish with avocado, pickled onions and do not forget the cherry on the top: the charred habanero! * If you need a homemade tutorial tortilla click here!